Step by step to a silent living room HTPC without any fan noise. 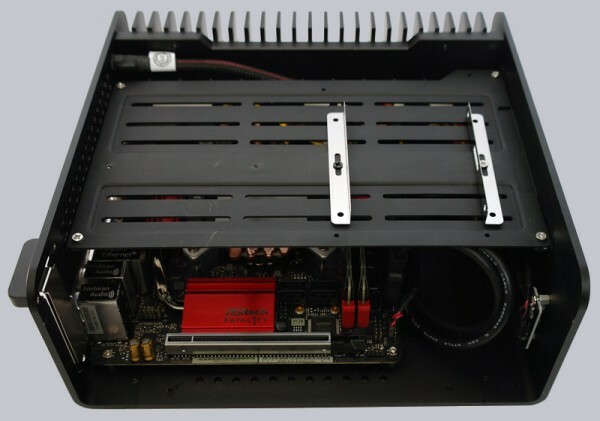 For the soon coming review of the Streacom FC8 Alpha ITX case, we have written a new HTPC construction guide. This time we have build even a completely silent PC for the living room. At this point we want to show step by step a completely Silent ITX HTPC Tutorial and what would be better as the just presented ASRock Z270 Gaming-ITX/ac LGA1151 ITX motherboard? 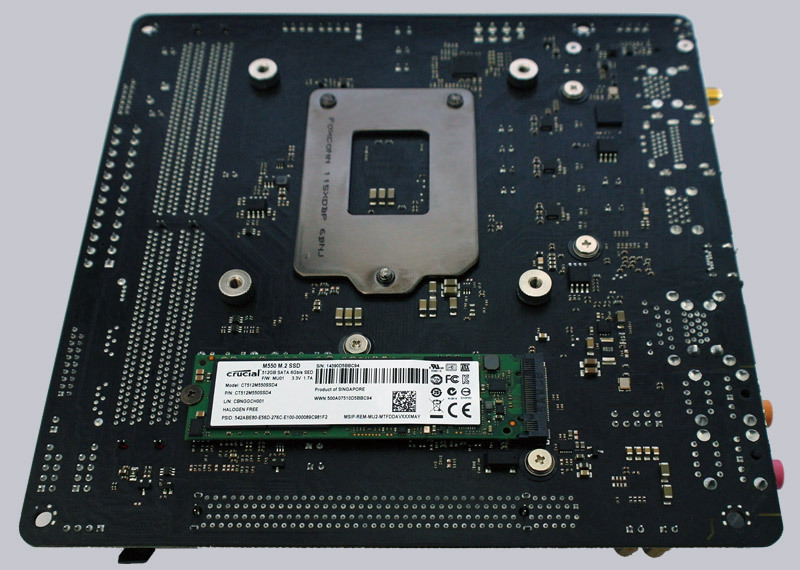 Before we install the motherboard into the case, we’ll install a Crucial M.2 SSD at the flip side of the motherboard. 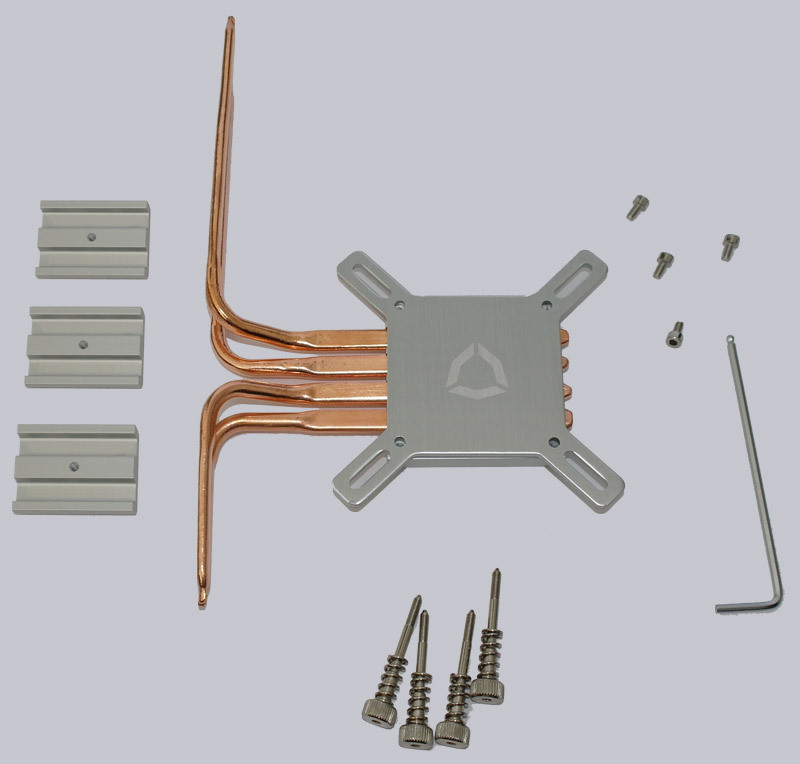 In addition we need to stick some buffers on the nuts – that is a little boring – but necessary for the later installation of the CPU cooler. Now we install the I/O shield and the motherboard. … then take measure inside of the chassis, and now equip with heat-conductive paste and screw properly. Because only so you can locate the correct spacing of the four heatpipes. 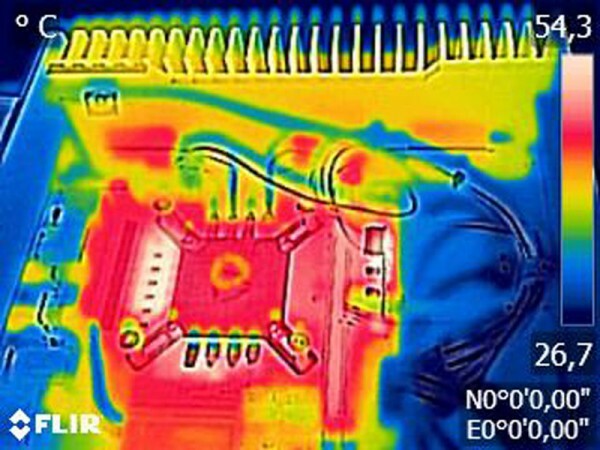 A little thermal compound is applied on the outside of the heat pipes, in the lower CPU cooler part and of course on the CPU during assembly. Then, the three connection blocks are screwed from the outside through the same cooling fins. For testing we have by the way installed an Intel Core-i5 6600K CPU and 8GB Crucial DDR4-2666 memory modules. Now we come to the power supply, which must be acquired separately. We have decided for the 160 Watt Streacom Nano160 PSU. 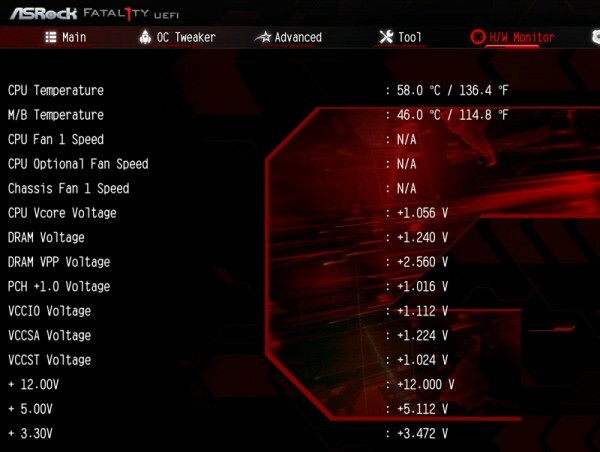 160 watts sounds not much, but it is more than enough for common CPUs. Only for the graphics card we have to do unfortunately smears, because the NanoPSU power supply has no graphics card connection. So for example you can install one Low Profile GeForce GTX 1050 Ti graphics card in the ITX chassis. Also, you should take care about the maximum output power at 12V 8A, 5V 6A, 3.3V 2A, +5VSB 1A and -12V 0.02A and a total output of 160W. For our HTPC build we have dispensed the graphics card and decided us for an Intel Core-i5 6600K processor with integrated GPU. 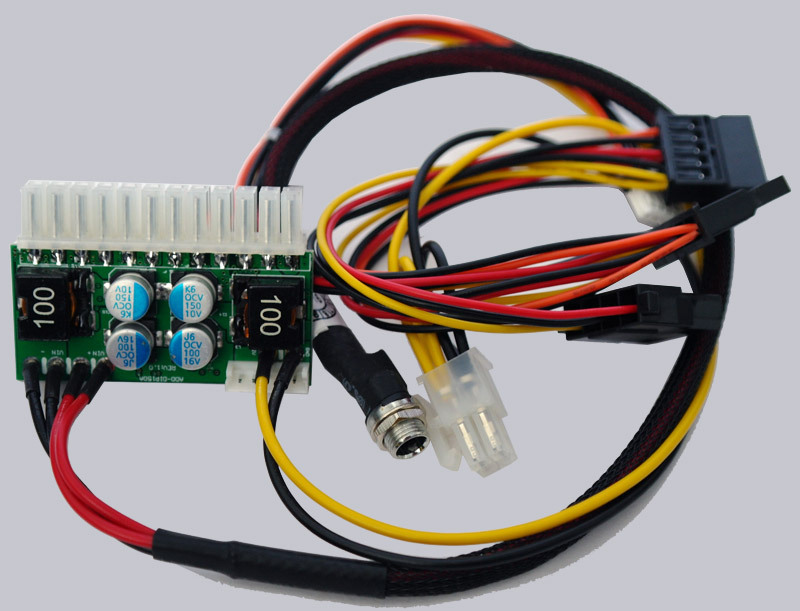 Here you can see the finished installation of the Nano PSU, more specifically the DC/DC converter on the 24 pin ATX connector with 2x SATA, 1x Molex and 1x 4-pin CPU cable. … and already the retaining plate for the drive can be mounted. Anyone who like to install a HDD, can screw the 3.5″ hard drive below and to install up to two additional 2.5 inch SSDs. Alternatively one can mount an optical slimline slot-in drive in the Streacom FC8B-OPT-ALPHA. And what you also should remember for the HTPC is the remote control. To remote control the PC we’ve published already numerous IR receiver instructions such as USB Ultra IR v2.0 guide along with IR receiver kit. 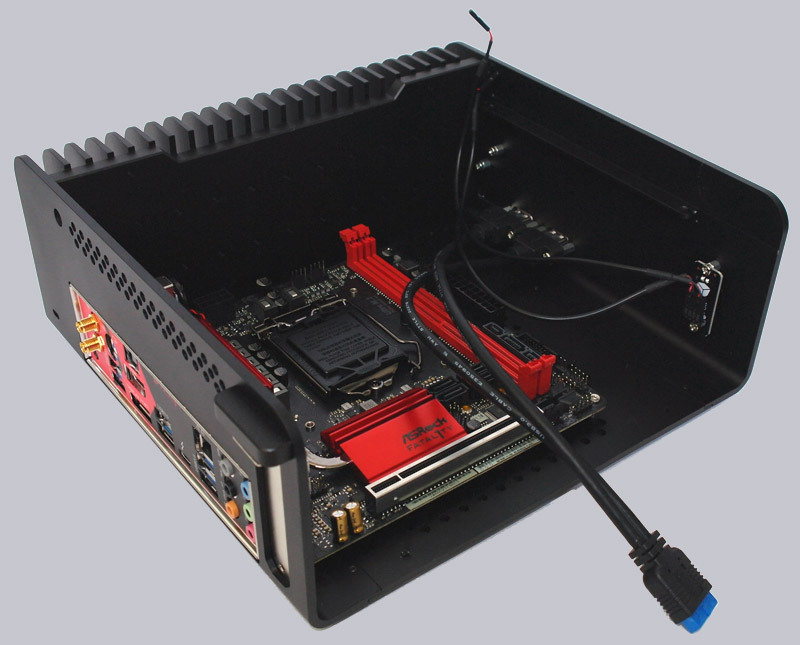 As mentioned previously, not the small Nano converter board is the actual power supply, because it must be connected now outside of ITX chassis. According to a consultation with the manufacturer, there are currently no internal power supplies available for this case. So the power supply and the WiFi antenna stay outside the enclosure. We come now to the most exciting moment of this fanless Media PC guide and turn the ITX PC on, then nothing, absolutely nothing to hear … pretty strange, if you hear nothing, no fan, no whirring hard drive! An absolutely silent PC! This is what we like to hear from a PC in the living room! Then, we want to clarify the question if the cooling concept works and will do different measurements. Thereby, we want to see how much power consumption is, because this is also an important thing for a HTPC. 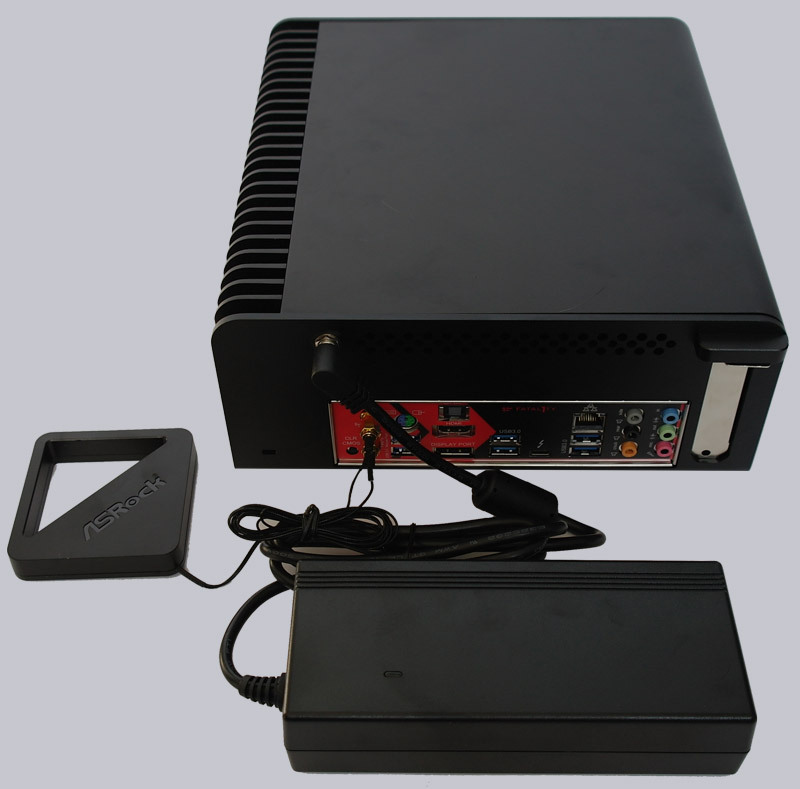 Disadvantages can have advantages, because the idle power consumption of the tiny Streacom Nano160 power supply unit with 160 Watts is much lower than with an bigger size 500 Watt power supply. And as you can see very nice, the Streacom FC8 Alpha chassis cooled the installed Intel Core-i5 6600K CPU with 91W TDP correctly even with longer load of 3DMark. Only a few hours of Prime95 housing with this CPU heat fanless ITX clearly. Here you can see a BIOS screenshot of PC health menus. 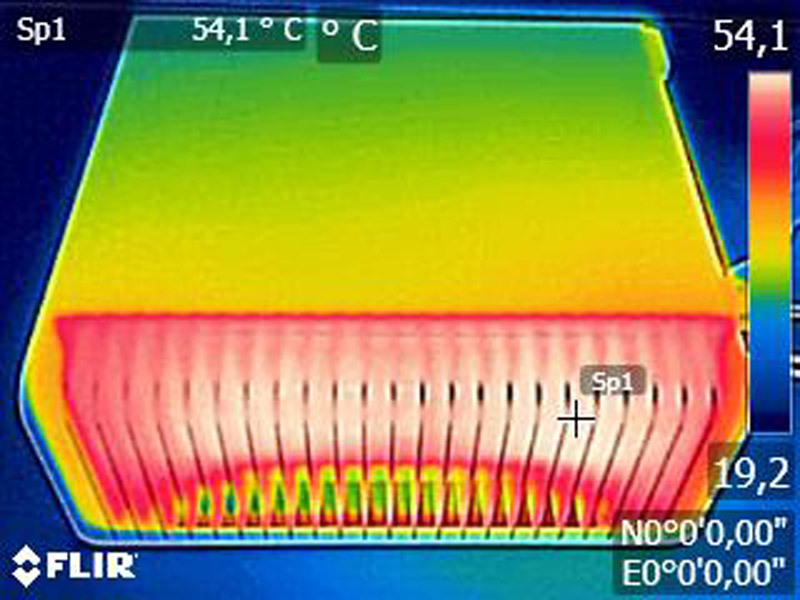 … because we have measured the highest temperature by up to 54.1°C between the cooling fins of the fanless ITX chassis. Here you can see very nice the heat distribution inside of the case: The VRMs together with the DC-DC converter of the Nano PSU have the highest temperature and heat of the CPU is transferred reliably over the four heatpipes on the cooling fins of the chassis. 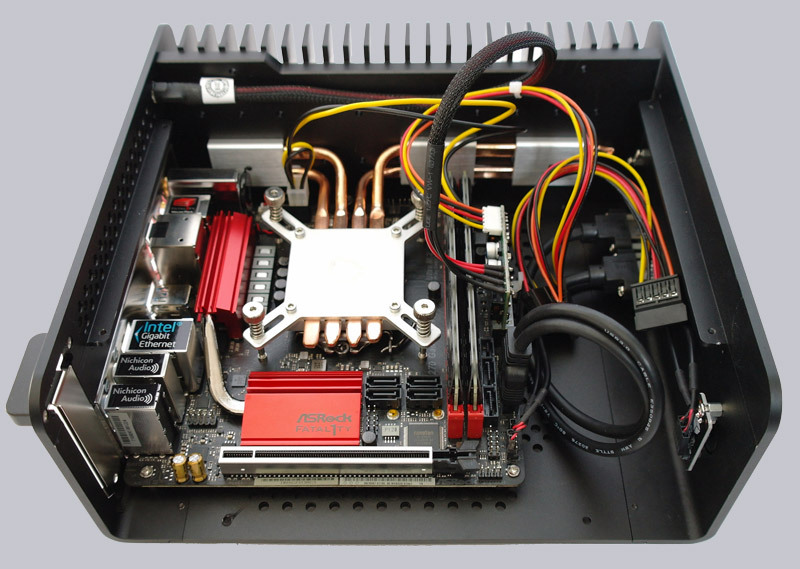 – The CPU cooler mounting is relatively challenging. – The large power supply is external. 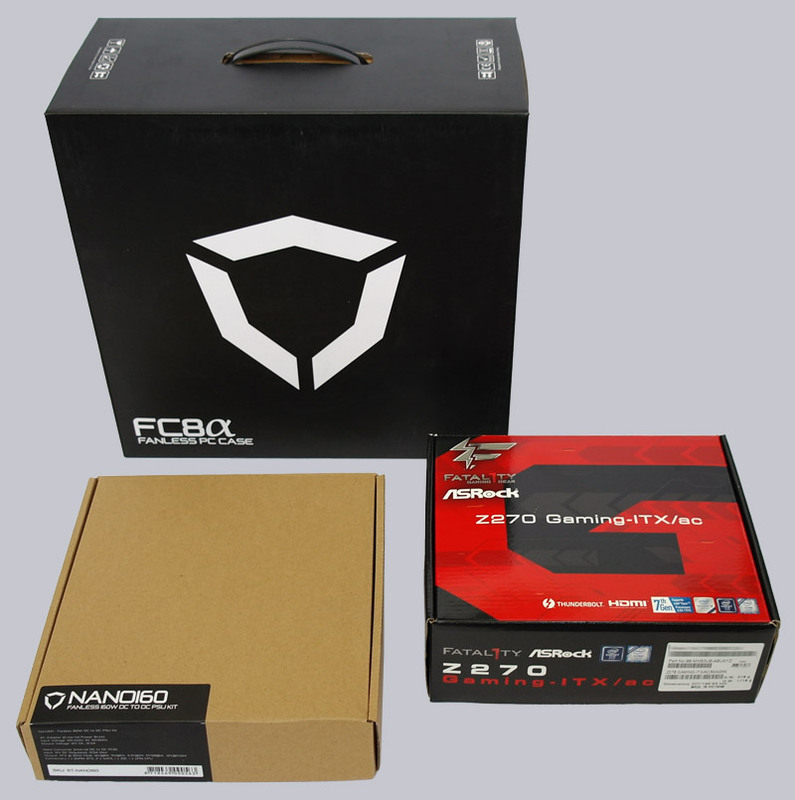 – The Streacom Nano160 power supply has no power connector for a graphics card. + Awesome design in elegant packaging. 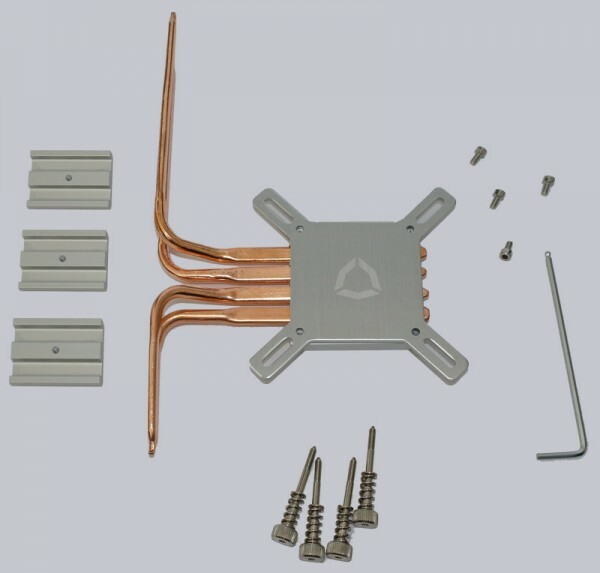 + CPU cooler is already included. + Fanless and absolutely silent when installing a SSD. 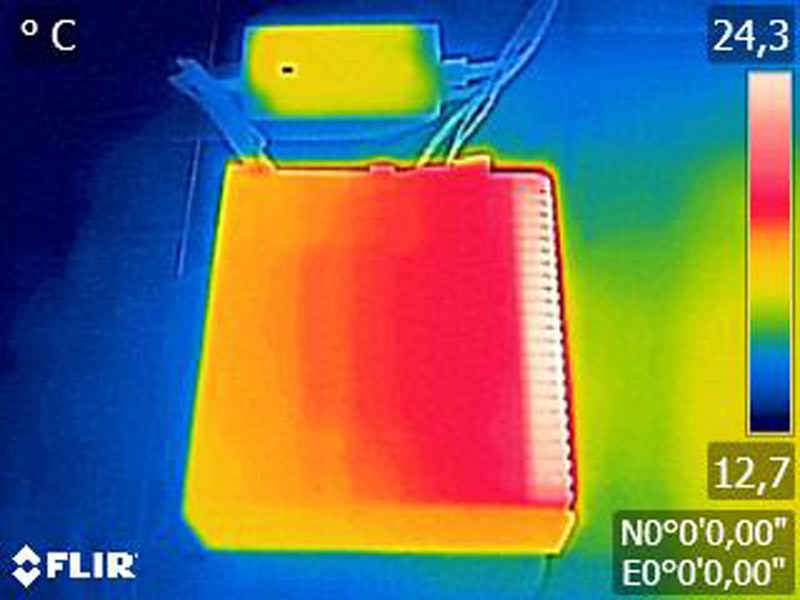 + Low idle power consumption of the Streacom Nano160 power supply unit. 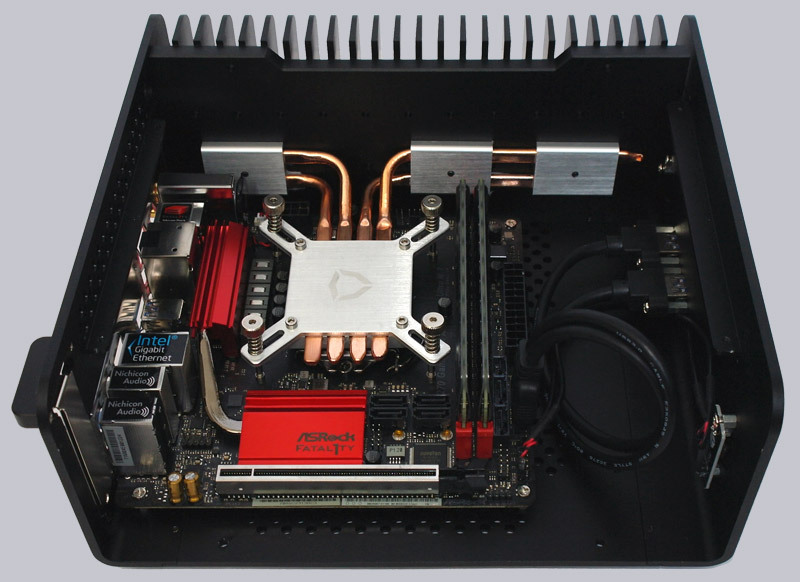 All further details of the ITX fanless chassis can be found in the detailed Streacom FC8 Alpha chassis review. 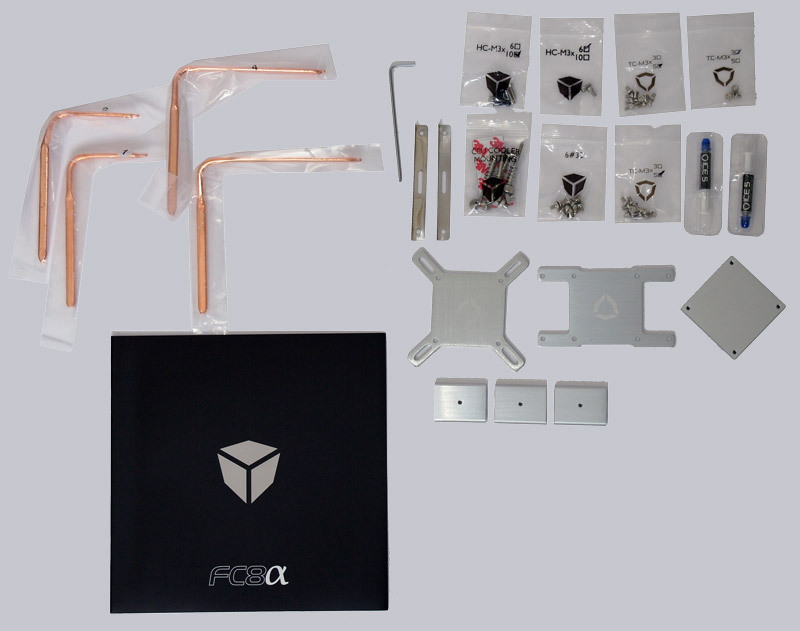 Here you can order the Streacom FC8 Alpha for a low price.